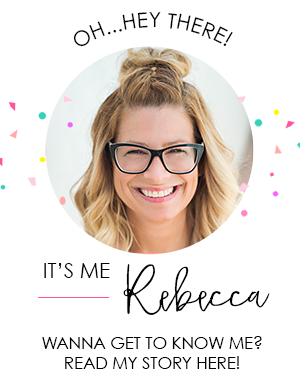 Geezyweezy…hard to believe it has been a year since this party and we have never shared it on our our blog???!!! So better late than never, right?? 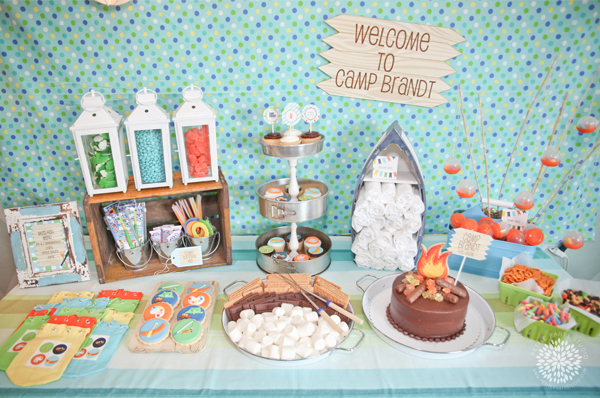 This theme for Brandt’s 4th birthday was PERFECT! His actual birthday falls around the time that the kids are getting out of school for summer break and what better way to kick off summer vacation but to have a summer camp birthday theme party, right? 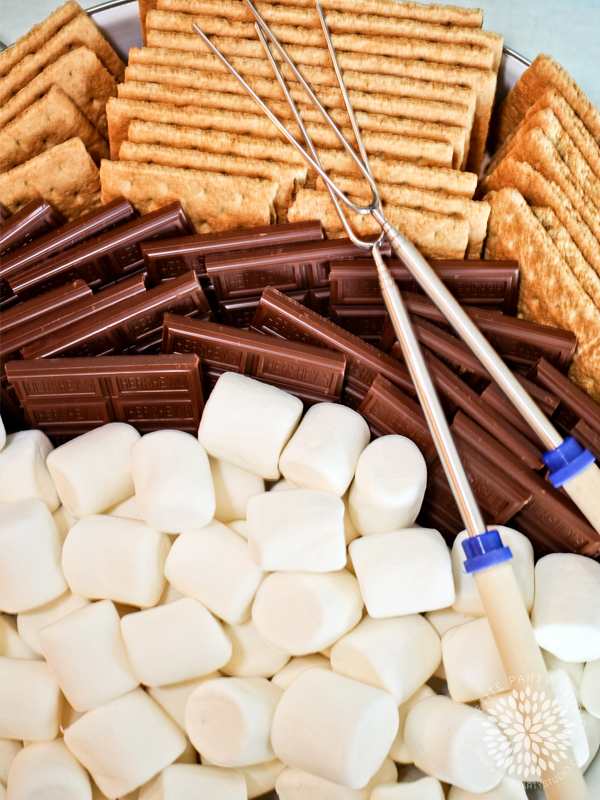 There are so many fun idea you can execute with a theme like this….s’mores station, cardboard canoe races, fishing pond, arts and crafts, the list goes on and the kiddos will not be bored. So, let’s kick off summer by sharing this fun party!!! My favorite party detail had to be the cake! 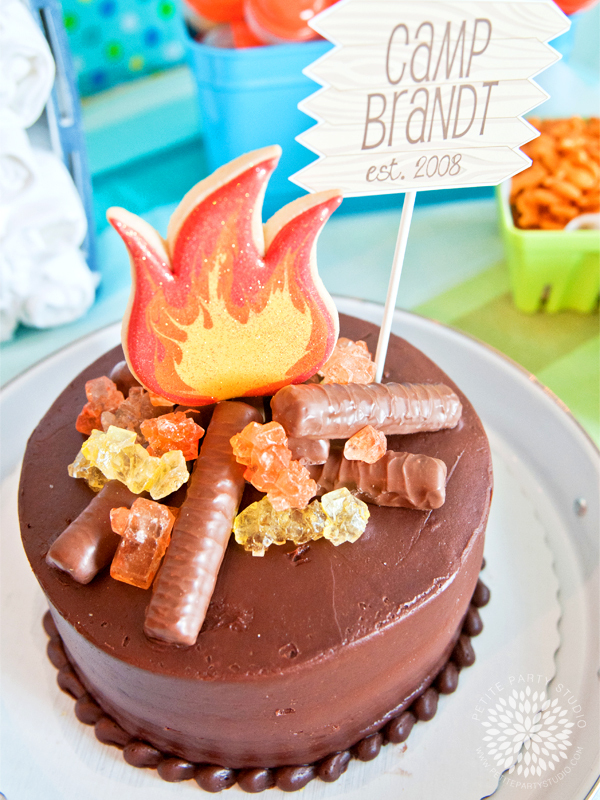 I had a 2 layer simple cake made, added some twix candy bars for firewood, rock candy crystals for embers and enlisted cookie genius Casey’s Confections to create the flame cookie. 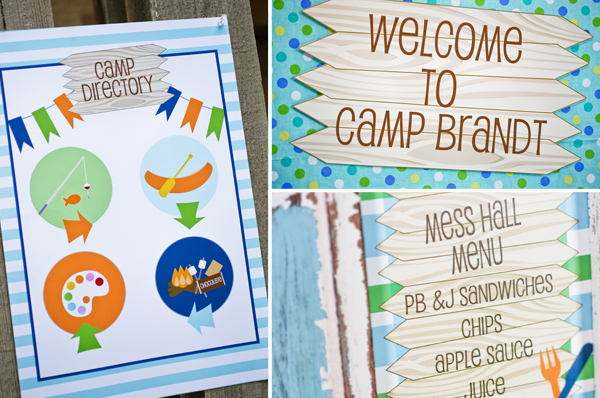 We then designed a faux wood “Camp Brandt” sign printable to top it off!! Various areas were marked with camp directories and signage. 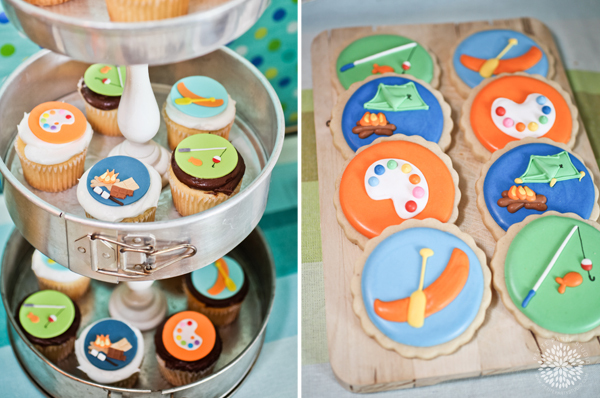 Look at the details in the fondant cupcake toppers from Edible Details & cookies from Casey’s Confections…AH-MAZING!! Mini fishing poles were made for the kids using mini bamboo poles attached to vending capsules all set up with bait & tackle. Instead of handing out pre-filled favor bags…campers were given logo printed mini canvas totes to fill up at the Camp Store. Items such as sun screen, travel toothbrush kits, glow sticks, and sunglasses were available. For the candy display, lanterns were filled with treats (gummy frogs, orange slices and m&m river rocks) to also take home. Another idea for craft and take home project gives campers the opportunity to make their own tie-dye t-shirt. 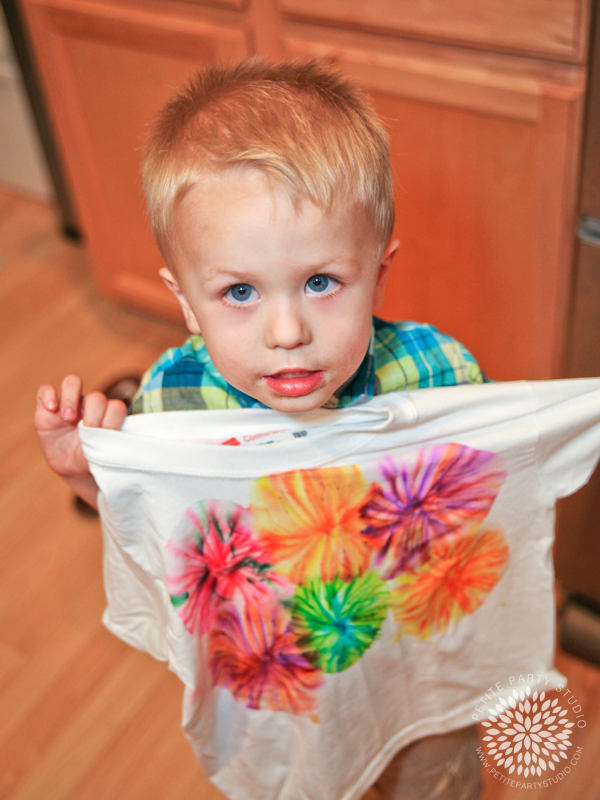 By using a cup, rubberbands, sharpie markers a dropper and rubbing alcohol; tie-dye tees are easy and relatively mess free. 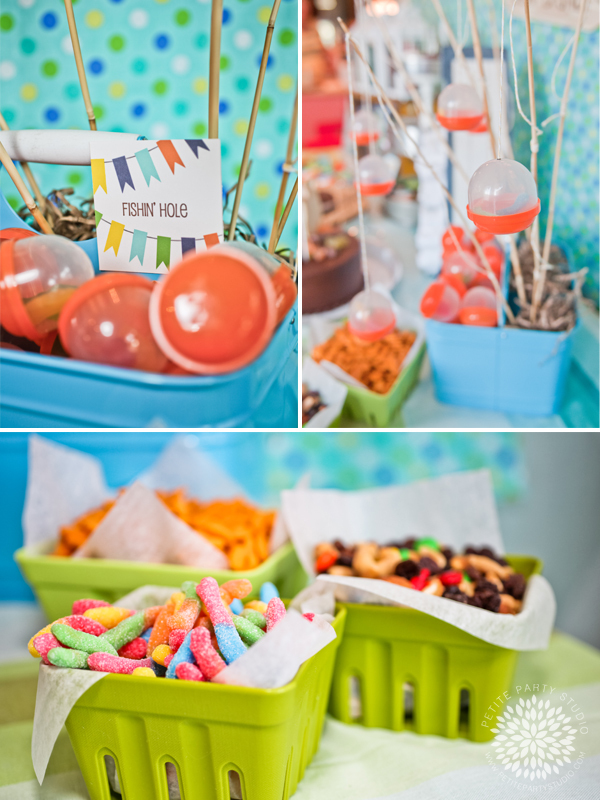 Everyone LOVED this theme, there are so many versions you can do to make this party a huge success. Do you love this party? 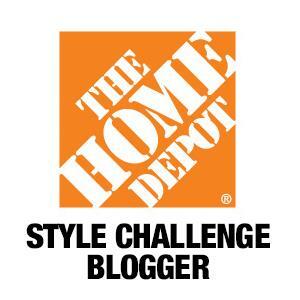 Find the printable collection HERE. 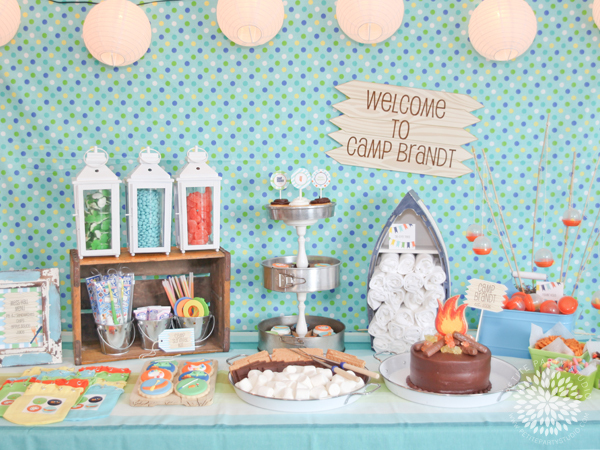 Have some great camp birthday party ideas? Leave a comment, we’d love to hear all about it!! Happy Summer!! Stumbled upon this post, and I like it! My kids would absolutely love what you did! The colours are great, and the fishin hole is pretty unique! I’ve got some ideas for my party now. What a fabulous summer party theme! And I’m loving the cake and those lanterns! What a great party! I am wondering if you can share how you did the t shirts? I love parties with a difference and this is it!! 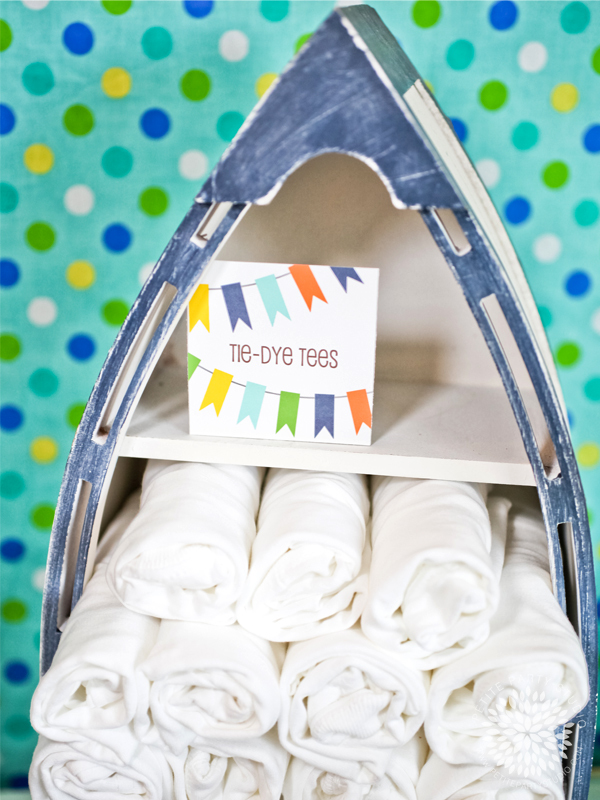 What a great idea getting the kids to make up their own party favors…makes it more fun too!